The following words are the story written using the diary style filled with notes and comments all along the operation. I’m gonna try to tell you the marvelous adventure of 3B7A on the island "île du Sud" on the archipelago of St Brandon through my memories and my feelings. Once installed in our seats, a long wait starts. Without any announcement for a long time, the atmosphere becomes tense. Mechanical problems on the plane are finally confirmed but could not be fixed by the techniciansimmediatly. The crew informs us of the cancellation of the flight and asks us to leave. It will be finally deferred to the following day evening. The other tasks were distributed between the various members of the team, the whole orchestrated by our leader Sebastien F5UFX. All the members of the team implied themselves in the test and the configuration of the stations, in particular the TRX SunSDR2 PRO during several weeks. 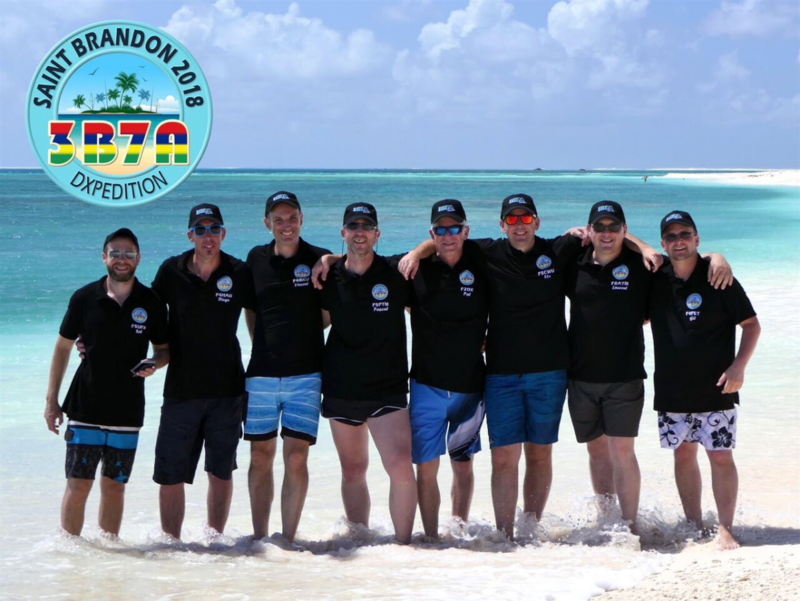 A 100% SDR expedition, the bet is dared, however we had already many positive feedbacks (including our own from FT4JA). We also tested our secondary equipments such as our coaxial “Messi&Paolini”, Low Band System bandpass filters, laptops during contests to approve their reliability and to accustom ourselves with their use. Most of the team members are still in Mauritius. This day starts with several good news !Florent F5CWU and Pascal F5PTM arrived well in the night and went ashore in the morning with all equipment after 26 hours of formed sea.The site is similar to the photographs with which we worked to prepare this expedition. They have been able to check and start the generators. Everything runs smoothly. In Port-Louis (3B8), we embark into the "Paille en Queue" (“white tailed”), a name in reference to these splendid birds of the Indian Ocean. This boat is smaller than the first one but well equipped for this kind of journey. 11h30 UTC… after 26 hours of sea, we distinguish the island just above the horizon and the imposing wreck of a boat who sank on the reef. Here we are ! For the great pleasure of the team, the "île du Sud"of the archipelago St Brandon appears above the coral reef where the lagoon radiates with its turquoise blue. This archipelago is composed of small islands and sand banks; It is also known under the name CargadosCarajos and is located at approximately 420 kms of Mauritius and is managed by “Raphaël Fishing Company” since 2008. The island is rather summary. It is a long sand bank just a few meters above the sea level with many tropical bushes. Birds are everywhere, and are nesting at that time of the year. Close to the house of the three coastguards, some palm trees draw up a path. There's 3 others small concrete building on the islet where the company workers are living. One of them is the guesthouse. This small paradise is a haven of peace for the birds nesting species which come to reproduce there. The main specie is the Gygis Alba with which we coexisted throughout the stay. As usual with our operations, we made our best to minimize our displacements and limit the deployment of equipment in order not to disturb the birds which nest nearby. We did not use certains areas due to the presence of too much birds. Several females brooded even their eggs on the edges of the windows of our small house. Towards the end of the stay, several births took place…. Magic moments! We have to admit that on this archipelago it is the human who is a guest not the birds ! We live temporarily on their territory and consequently we are humble and respectful of the place. The first QSO is completed on 20m SSB at 19h00 UTC with EA7/OH3ELB.We start also our activity on 17m SSB, 40m CW and 30m RTTY. All operators are smiling as soon as the pile-upintensify. The concentration is maximum in spite of the tiredness and the 30 degrees in the patio. The SunSDR2 PRO works marvelously well (what a powerful product in a small box). The settings chose prior to the expeditions give satisfaction. No one seams disconcerted by this new technologie. The VFO (E-coder) is ludic and gives access to the main functions. The association of the SDR is perfect with our lightweight amplifiers Expert SPE 1.3K whatever the mode of trafic used. The visualization of the pile-up via the spectrum displayed on the laptop is impressive and extremely useful to manage the trafic.We are feeling good and we will give the maximum to fulfill the wishes ofthe amateur radio community. Tiredness is obviously felt. For one week we have slept only by sequences of a few hours in heat. Undoubtedly the cohesion of the group and the attention of the ones towards the others is omnipresent. It makes possible to combine relaxed environment and effectiveness during our shifts.The tide of the ocean became suddentlystronger.Installed on the beach, we have to check regularly the guying of our masts. Some anchor points have been reinforced. Sebastien F5UFX continuously points out the instructions and the propagation slots whom should not to be missed towards certain areas of the globe. Each station has a document prepared by Pat F2DX whom shows the VOACAP/K6TU predictions. With such informations, we know where to listen. The signals on 80m are weak and the noise level is very high. The 160m stations is close to the 1000 contacts, using a Spiderbeam 18m mast with a wire hat also provided by our friend Cornelius DF4SA. - We voluntarily leave rather broad Split so that the stations having small installations can contact us easily. It is often their only chance. - On SSB, much of frequencies between the decimal 0 and 5 are not used. At home, we have the feeling that there is stations calling everywhere but at the other end of the pile-up is sounds much different !Do not hesitate to use all the split range, not only by 5khz steps. - Sometimes, the rhythm dropped a little bit. This is because we were in search of small signals. Honestly, we can tell you that many have been logged because we saw the signal peak on the spectral visualization of the SDR. Not certain that using a classic VFO their signal would have been detected so easily. - To help the operators, please always call with your complete callsign instead of 2 ou 3 letters. It is a BIG waste of time and make the operators nervous and irritating ! - The requests of QRX to listen to a continent in particular are not made to annoy people ! We understand that it can be frustrating to listen a station DX with large signals working other continents. But, that's the game ! Certain zones of the world do not have the chance to hear us almost around the clock but have only a 1 or 2 hours propagation window ! Sorry if this windows happens when you are back from your work ! Propagation has been very bad during the last night and we have not been able to keep all stations on the air. This is the last day of the operation for most of the operators. Only F4FET Gil and F4HAU Diego will remain on the island. Our 6 friends leave the islands in the morning. Suddenly, a silence after 10 days of intensive activity ! The usual peace of this place re-appears and it is as pleasant as perturbing. However, our 6 friends entrusted us the mission to go beyond the 70,000 contacts and completethe logistical operations. So, it remains a lot of work for our two-persons team ! We sit down again at our radio stations to live our last moments on this IOTA lost right in the middle of the Indian Ocean. Contacted on 30m RTTY, PA0MDB will be our 71.158th and last QSO. Once the crates transferred from the shore to the boat of the Raphaël Fishing, we leave St Brandon and head for Maurice. Let's go for 26 hours of sea accompanied by a crew of fishermen, with a formed sea which, as with the outward journey, handle roughly our stomachs. ......."Only one question remains since our return in France …this cohesion and this desire of going always further, over our own limits… where will it carry us the next time?"...... I really hope to Crozet Isl. (French Antarctic Territory)!! !